A lot of advertisers I work with are not aware of how long their customers take to convert. However, knowing your sales cycle is important information for many reasons, including to better understand the results you are getting from your advertising efforts and to further optimize your campaigns and marketing efforts. Some products, like lead generation websites, have faster conversion cycles since there is a less of a commitment on a user’s end. Others, like many e-commerce sites or B2B products, can have much lenghtier sales cycles. To figure out where you stand, you can check out AdWords Search Funnels. You’ll need to have AdWords conversion tracking enabled in your account to access this information. 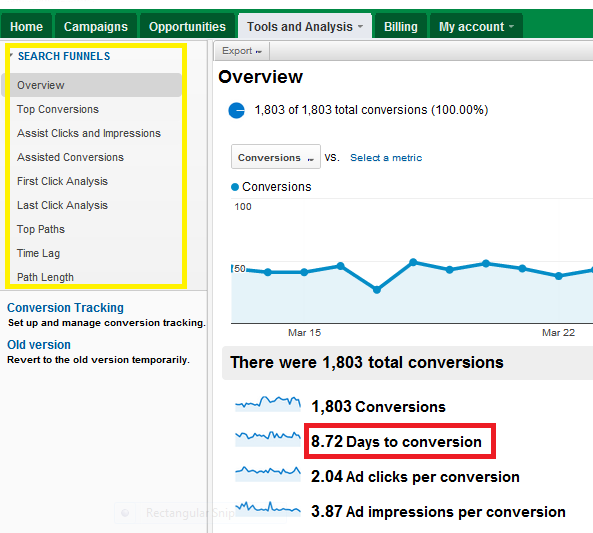 In your AdWords account, go to Tools and Analysis and select the Conversions sub-tab. Next, click on Search Funnels to get the following view. On this screen, you’ll be able to see the average days to conversion, as well as how many clicks and impressions it takes to convert a customer. If you click deeper within the links below the overview tab, you can find out even more information and details, including how the various campaigns and keywords work together and relate to your conversions. Keep in mind that this information is, of course, specific to your AdWords account and that it’s likely that users from other traffic sources are converting a bit differently. If your average visitor takes several days to convert, keep this path in mind as you analyze your metrics and launch new campaigns. It might take longer for you to truly understand the impact of any new promotions or optimization efforts, since your conversions are not immediate. You may also want to add in time sensitive offers to help speed your visitors along their decision process. If you have lengthy conversion cycles, I also suggest you use remarketing to remind visitors of your brand. I suggest all advertisers try remarketing, but it’s an even more important strategy for advertisers that need to stay in their customer’s minds, as these customers take their time to make a decision and research further. You can read more about what remarketing is in my previous post and also learn about remarketing best practices here. This entry was posted in AdWords Conversion Tracking, Google AdWords, Remarketing, ROI and tagged adwords conversion time lag, adwords search funnels, conversion oath, roi time lag, sales cycle adwords, search funnels, time to convert on April 13, 2012 by kristina. Before you can analyze and make decisions on individual keywords, make sure you have conversion tracking set-up first in your Google AdWords account. Conversions are specific actions you care about on your website, such as lead submissions, white paper downloads, or most commonly, sales. If you’re not tracking conversions already, enable conversion tracking within your Google Adwords account first. You’ll get a code snippet to be placed on a page that’s usually a confirmation page for a desired action. Once you’re tracking conversions, review your data regularly and make decisions based on patterns you’re seeing. If a keyword is getting a lot of clicks but few of those clicks are resulting in a conversion, you may want to lower your CPCs or pause that keyword entirely. This will save you $ and allow your PPC budget to be spent on other, more profitable terms. In the example below, I paused a keyword that generated clicks and had a good CTR but resulted in only 1 conversion and a relatively high cost/conversion. This entry was posted in AdWords Conversion Tracking, Google AdWords, Keyword Optimization, PPC, ROI and tagged conversion tracking, Google AdWords, roi on June 26, 2010 by kristina.